The Virgin with the Christ Child and a donor, n.d.
Oil on panel, 82 x 74 cm. Behind a porphyry sarcophagus, a kneeling donor is blessed by Madonna and the Christ Child. The Christ Child makes the sign of the cross (Signum Crucis) with his hand while the pious Virgin Mary places her hand on the donor’s head. The sacred scene is framed in part by a red curtain, with a rocky landscape making up the distant background. Francesco di Simone belonged to a group of painters from Santa Croce who lived in Venice and were influenced by the Venetian school and its master, Giovanni Bellini. This influence is clearly evident in both the painting’s idiom and content. As with the works of the Venetian masters, the composition here is dominated by a strong and saturated colouration, the intensity of which is highlighted by the major contrasts between cold and warm shades of colour. 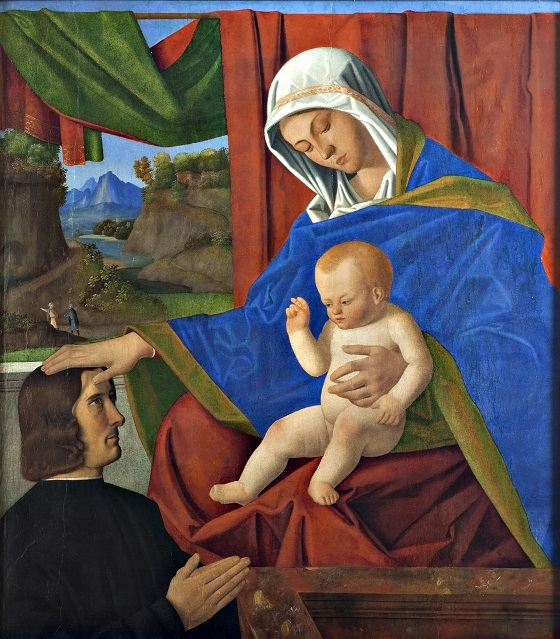 The Virgin Mary’s blessing gesture in this painting is furthermore inspired by Bellini, who is thought to be the originator of this manner of depiction of Madonna in donor portraits.